We’d love your help. 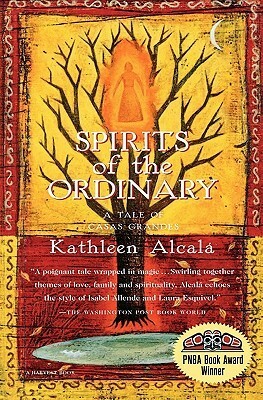 Let us know what’s wrong with this preview of Spirits of the Ordinary by Kathleen Alcalá. This “strong and finely rendered book” (Larry McMurtry) takes us to the Mexican-American border in the 1870s, conjuring up a magical tale of faith, gold, and family passions that “echoes the style of Isabel Allende and Laura Esquivel” (Washington Post Book World). Winner of the Pacific Northwest Booksellers Association Book Award. A spectacular tapestry of folklore, spiritu This “strong and finely rendered book” (Larry McMurtry) takes us to the Mexican-American border in the 1870s, conjuring up a magical tale of faith, gold, and family passions that “echoes the style of Isabel Allende and Laura Esquivel” (Washington Post Book World). Winner of the Pacific Northwest Booksellers Association Book Award. To ask other readers questions about Spirits of the Ordinary, please sign up. I loved this book. Rich with biblical themes and Mexican history, it has a poetic simplicity that is engrossing. I didn't want it to end. Thankfully there is a sequel. This book is one of a number of novels which followed on in the wake of One Hundred Years of Solitude and the Latin American magic realism boom. This book is not a simple Marquez or Allende wannabe. Unusually it combines Jewish mysticism with the dual belief systems of the indigenous peoples and their Catholic Spanish overlords. Kathleen Alcala, although a US citizen, comes from a Mexican family and regularly stayed in the area she writes about as a child. This gives the book great authenticity This book is one of a number of novels which followed on in the wake of One Hundred Years of Solitude and the Latin American magic realism boom. This book is not a simple Marquez or Allende wannabe. Unusually it combines Jewish mysticism with the dual belief systems of the indigenous peoples and their Catholic Spanish overlords. Kathleen Alcala, although a US citizen, comes from a Mexican family and regularly stayed in the area she writes about as a child. This gives the book great authenticity and the reader has a strong impression of the landscape, towns and culture of the area. In addition Alcala draws on the mix of Judaism and indigenous beliefs held by her mother's family. As the book makes clear, Judaism was still a persecuted religion at this time, practiced behind closed doors and far removed from organised Judaism and so open to dilution. There are several forms of belief in the book. One is Julio's strenuous approach, obsessively pursuing the Lord's truths and plans for the world in the texts and alchemical formulae that he hoards in his secret room, shuttered against the eyes of the world. When he tries to apply this approach to the garden, he ends up destroying its life force. Julio's wife, Mariana, dumb since being attacked as a child, is the opposite of her husband, open to receiving the divine through her oneness with nature. And then there is their son, Zacarius, who starts off as obsessive as his father destroying his marriage in his pursuit of gold and silver in the hills of Mexico, but who discovers a mystical understanding of the world and god through his experience of the local indigenous peoples and nature. These belief systems are in turn contrasted with the severity, worldliness and intolerance of Roman Catholicism. The book jumps from the story of one character to another, and not just Zacarius and his parents, but also Zacarius' wife Estela and her family, the Zacarius' twin brother and sister, even a visiting photographer gets a chapter or two. Unlike One Hundred Years of Solitude where the width of canvas could allow us to view a whole family through several generations, this novel is comparatively slim and so the movement between characters is jerky and unsatisfactory. That is not to say that the characterization is not good, it is. I would have preferred it if the writer had focused on giving us more of a narrative of Zacarius' life and the Jewish side of the family. This was good, but something about the beginning and ending felt disconnected to me. I enjoyed the crossing of religions and culture, and the simple pacing, but sometimes I felt the author was telling me what to think, instead of allowing me to make connections, and perhaps that's why I felt disjointed from the characters and plot. Una manera amena y cálida de viajar a fines de siglo XIX a la frontera de México. This was a lovely book - it flowed nicely, it was an enjoyable read. My only major problem with it is that it didn't leave much of an impression on me. It's been all of a day, and I already feel like I'm starting to forget things about it. The characters of the androgynous twins were interesting, but seemed to go no where. They existed on the periphery of the n This was a lovely book - it flowed nicely, it was an enjoyable read. My only major problem with it is that it didn't leave much of an impression on me. It's been all of a day, and I already feel like I'm starting to forget things about it. The characters of the androgynous twins were interesting, but seemed to go no where. They existed on the periphery of the narrative, and then, near the end, abruptly turn up dead in a dry well, with little bearing on the narrative. Similarly, the character of Corey, the woman who is cross-dressed so that she can work as a travelling photographer, exists, is given some build up, but then just disappears from the narrative. The overall narrative seemed, to me, to revolve frustratingly around Zacarias, who was, in my opinion, the least interesting of the characters. Some of this could be because his notes, fluttering across the countryside may or may not be the "impetus" for the entire story, but I still wasn't particularly interested in him - besides, the narrator was too omnipotent for it to be from the recollections of Zacarias, who spent much of his time too enamoured of his own expeditions to really notice the needs or desires of those people around him. Here's what you need to know about Kathllen Alcala's "Spirit of the Ordinariness": At the turn of the 19th century, a disoriented and disconnected Mexican leaves his beautiful wife and family in Saltillo for the hills. Zacarias prefers a life of struggle on the trails to a life of security at home. Of course, he's weird. Certainly he is out of his mind, and no one fathoms what is his problem. After all he is a Mexican Jew! Kathllen Alcala may have special insight in writing this tale. It seems t Here's what you need to know about Kathllen Alcala's "Spirit of the Ordinariness": At the turn of the 19th century, a disoriented and disconnected Mexican leaves his beautiful wife and family in Saltillo for the hills. Zacarias prefers a life of struggle on the trails to a life of security at home. Of course, he's weird. Certainly he is out of his mind, and no one fathoms what is his problem. After all he is a Mexican Jew! Kathllen Alcala may have special insight in writing this tale. It seems that for the first 20 years of her life, she too found herself searched for her true identity until she found out the same thing her character Zacarias found out. She too is a Mexican Jew. And so here the craziness begins. Zacarias meets his match in the Rarurami Indians of Chihuahuas Copper Canyons. Faced with suspicion. Threatened with violence. Desperate for a way out, he reaches back into his soul to share with these Indians the only stories that made sense to him at the time. Of course, he's never been sure to think about Biblical folk tales his father has passed down to him. He spouts one after another, and the Raramuri eat them up. They may not understand his Spanish. He's not sure what the hell he's saying in their language. What? No, seriously, do you ever read a book and then wonder what the point of it was or if you missed it. I feel like I missed the point of this book. Honestly, there was so much going on and too much was crammed into just a few pages. This would be better as something far bigger and in depth than what it came to be. Revolving around the Caravals family, each member seems to have something going for them. Julio is a Jew who practices mystical alchemy. His wife, Mariana, is mute because she was What? No, seriously, do you ever read a book and then wonder what the point of it was or if you missed it. I feel like I missed the point of this book. Honestly, there was so much going on and too much was crammed into just a few pages. This would be better as something far bigger and in depth than what it came to be. Revolving around the Caravals family, each member seems to have something going for them. Julio is a Jew who practices mystical alchemy. His wife, Mariana, is mute because she was visited by angels. Their son, Zacarias, is a prospector always leaving his family to look for gold who ends up becoming a mystic himself. Then there is his wife, Estela who is just trying to keep her family together as her husband drains funds trying to find gold in the desert. And this is just the beginning, Estela has twin siblings who are water callers and have a whole mysterious thing about them going on as well. Nothing was ever explained and nothing ever really came to a point or reason. The stories of these people just kept going on with no reason or purpose. This is a lovely magical realism book set along the Mexican-American border in the late nineteenth century. The story doesn't follow any one character in particular; it's more a tale of an extended family and their struggles with obsession. To me it really echoed One Hundred Years of Solitude, with that same languid feeling and sprawling nature of the story. Zacarius is monofocused on the search for gold in the mountains. His father Julio searches through the Kabbalah to find God's perfect order This is a lovely magical realism book set along the Mexican-American border in the late nineteenth century. The story doesn't follow any one character in particular; it's more a tale of an extended family and their struggles with obsession. To me it really echoed One Hundred Years of Solitude, with that same languid feeling and sprawling nature of the story. Zacarius is monofocused on the search for gold in the mountains. His father Julio searches through the Kabbalah to find God's perfect order. Their obsessive desires come close to destroying their families, their wives Estela and Marina, and Zacarius's children. Between and around those obsessions lie stories of Jewish mysticism and Catholic intolerance, the love of nature and the love of order, how clinging too hard can destroy something, and how dreams coming true sometimes fall apart. I thought the book was a little jumpy in places, but it was really a lovely story. Like an impressionistic painting. Well how wonderful was that! Sigh. I felt as I've been visiting with some of my old friends and that the characters in this book are out there mingling with those from The Hummingbird's Daughter, Like Water for Chocolate and Rain of Gold. Like Luis Urrea, Laura Esquivel and Victor Villasenor, Kathleen Alcala is a master storyteller sharing a bit of the country's history along with a richly complicated genealogy, a setting that gallops north and south across deserts and mountains and more than a Well how wonderful was that! Sigh. I felt as I've been visiting with some of my old friends and that the characters in this book are out there mingling with those from The Hummingbird's Daughter, Like Water for Chocolate and Rain of Gold. Like Luis Urrea, Laura Esquivel and Victor Villasenor, Kathleen Alcala is a master storyteller sharing a bit of the country's history along with a richly complicated genealogy, a setting that gallops north and south across deserts and mountains and more than a few hints of magic/paranormal/healing/faith/ (whatever it is I like it). I enjoyed it, but I think I've enjoyed some of the other Latin America magical realism novels a little better. House of the Spirits and Bless Me, Ultima just seemed to have so much more depth to them. Then you get to things like Mariana's muteness which just seems too similar to Clara's muteness for it not to seem at least a little derivative. Though it does deal with Jewish Mysticism rather than Catholic Mysticism, which is a drastic change. Not quite sure why the gringo photographer was given a whole chapter. Came to the conclusion that the author is into cross-dressing. Book seemed disjointed although some characters were interesting. I wish she had focused on just one character throughout. Beautiful plot and imagery. However, the characters fell flat and the plotlines amongst them seemed to end abruptly. I wanted more magical realism. Average. It was good of its kind. I prefer books with a more coherent storyline, although there was something interesting in the "mystical" dreams. the story was entertaining, it took me to mexico. Alcala fictionalizes tales of her ancestors in Mexico. There are elements of magical realism reminiscent of Gabriel Garcia Marquez but she doesn't measure up to him (not that many do). Kathleen Alcalá (born 29 August 1954) is the author of a short-story collection, three novels set in the American Southwest and nineteenth-century Mexico, and a collection of essays. She teaches creative writing at workshops and programs in Washington state and elsewhere, including Seattle University, the University of New Mexico and Richard Hugo House. Alcalá is also a co-founder of and contribut Kathleen Alcalá (born 29 August 1954) is the author of a short-story collection, three novels set in the American Southwest and nineteenth-century Mexico, and a collection of essays. She teaches creative writing at workshops and programs in Washington state and elsewhere, including Seattle University, the University of New Mexico and Richard Hugo House. Alcalá is also a co-founder of and contributing editor to The Raven Chronicles. A play based on her novel, Spirits of the Ordinary, was produced by The Miracle Theatre of Portland, Oregon. She served on the board of Richard Hugo House and the advisory boards of Con Tinta, Field’s End and the Centrum Writers Conference. She is the winner of several awards for her writing, including an Artist Trust/Washington State Arts Commission Fellowship in 2007. Alcalá resides on Bainbridge Island, Washington.